Last Thursday, I turned another year older! I really wanted to make my own birthday cake, but was too busy catching up on school work for my midterms this week, I didn`t get a chance. It's okay, I much prefer an ice cream cake over a regular cake any day. Plus, my roommates got me an ice cream pie from a nearby homemade ice cream parlor. It was delicious! Hehe. 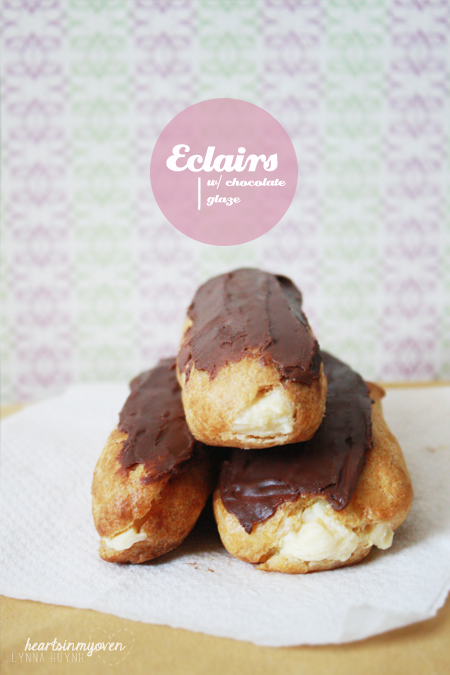 Today, I`m posting about éclairs! I made them a few months ago but didn`t get a chance to post about them. The slogan of this blog is "food for those we love." I definitely made these éclairs with one person in mind: for my boyfriend. He loves chocolate and whenever I made cream puffs, he would ask me to make éclairs since he loves the chocolate on top. I`ve always kept him in mind whenever I decided to bake anything, since he was my first taste tester. Recently, we broke up and I`m going through my first heartbreak (I`m still young!). Thus, I lost my baking mojo for a bit and didn`t feel like blogging as I recuperate. Since, this does affect the blog's content slightly, I felt it was necessary to mention. This also makes me closer to you, because you get to know me on a more personally level! :) I`m feeling much better now and I`ve been itching to bake! Enjoy these~ I thought these were great and always ate a few in one sitting! Make them for Valentine's Day, or make them for your friends. They`ll definitely enjoy these eclairs. 2. In a medium saucepan, over medium heat, add the water, butter, sugar, and salt. Let it boil. 3. Add flour to saucepan. 4. Using a wooden spoon, stir it around as the dough pulls away from the pot and forms a ball. 5. Remove saucepan from heat and cool for 5 minutes. 6. Next, add the eggs, one by one and mixing well in between each egg. The dough will be smooth and shiny. 7. Place pastry bag in cup and fold edges over the top of the cup. 8. Spoon dough into pastry bag. Snip the tip off the bag. 10. Bake for 30-35 minutes, or until golden. 11. Allow to cool enough to touch. 12. Split éclairs in half and allow them to cool completely. 13. In a medium size bowl, add the egg yolks. Set aside until step 18. 14. In a small saucepan, add sugar and cornstarch. 15. Gradually add milk, stirring until smooth. 16. On medium heat, boil the mixture until bubbly. 17. Lower the heat to low and continue to stir for about 2 minutes. 18. Pour about half the milk mixture into the bowl with the egg yolk, while whisking the egg yolks. 19. Transfer everything back into the saucepan and bring to a boil, constantly stirring. 20. Cook for another 2 minutes. 21. Remove pan from heat and add in the butter and vanilla extract. 22. Allow to cool and fill éclairs before serving. 23. In a heat proof safe bowl that's placed over a pot of simmering water, melt chocolate and heavy cream (do not stir, let it melt for a few minutes before slowly stirring). 25. Add powdered sugar and stir to combine. 26. Add water, 1 tablespoon at a time, mixing in between until it reaches your desired pouring consistency. (I used 5 tablespoons of water). 27. Allow glaze to cool slightly before spooning on top of éclairs before serving.